Work and play – a possible combination? I have always been puzzled by my somewhat selective memory. It seems that for exams at the University I was always able to remember the way the page looked, instead of the text that I should have remembered since I read the book. So, after a lot of trial and error I have come to the conclusion that I have a picture memory. Since I started working Post-it notes have been my best friend, but earlier I didn’t understand why. Now I do. 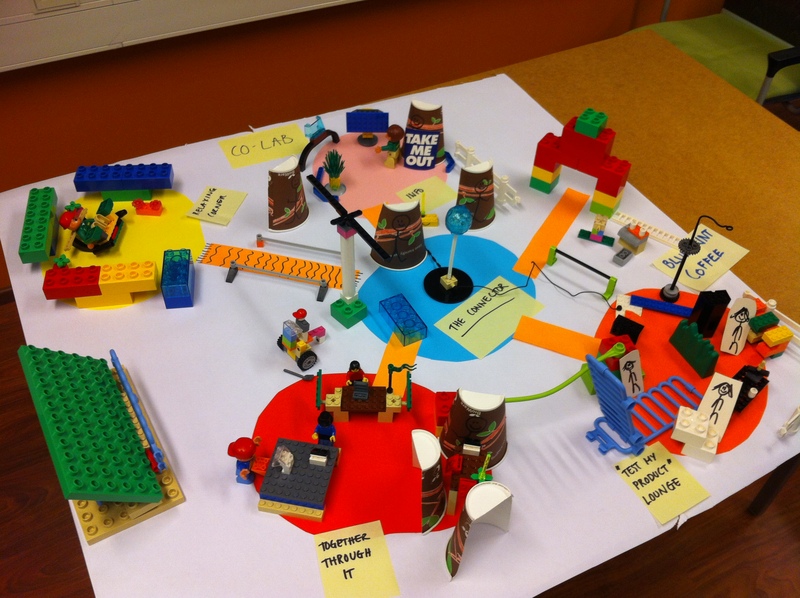 Our SID journey started during the first days of September with a course in Design Thinking. Already when I stepped in, I could feel I was in a room filled with multidisciplinary talent but similar thought. Post-its and legos could be seen lying around. It felt like home. Since the world of Design Thinking must be experienced hands-on, we didn’t waste a lot of time taking but started to exercise our mind according to the teachings of Design Thinking. 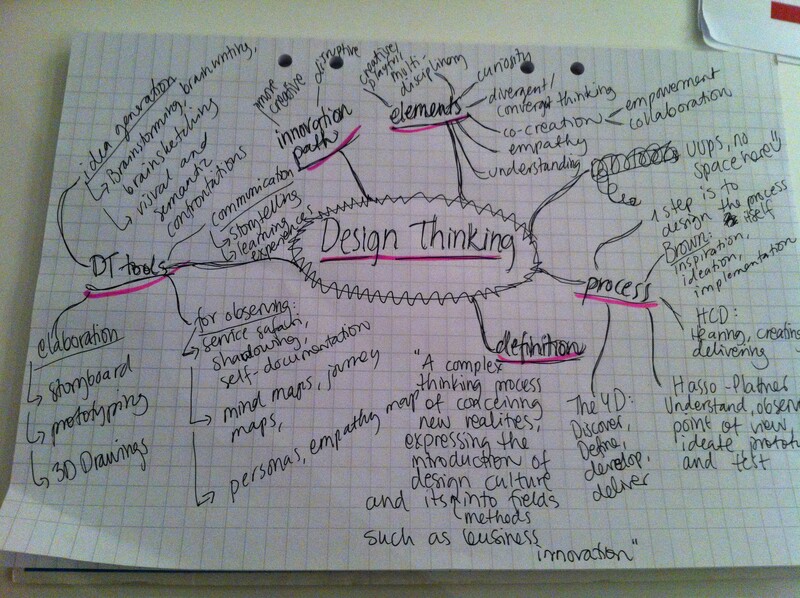 In the essence of Design Thinking I will not go through in words what Design Thinking is, instead please have a look at my mind map below. This mind map is a summary of the material I have read for this assignment by Tim Brown and Katja Tschimmel. To give a brief summary of how I feel about Design Thinking is that it is a method that uses methods used in design to visualize a thought or a process. Design Thinking is not directed at the designers alone, the core of the method is in its way of uniting a multidisciplinary team around the same challenge. To be able to express your thoughts in a divergent, creative and visual way, regardless of whom you are sitting with, is the basis of the method. As mentioned earlier, Design Thinking must be done, it can’t be read about. During our session we utilized a Design Thinking tool (DT tool) called brainwriting. This is very all the post-it notes were pulled out and I felt at home. But to think in a divergent way was a bit tricky at first, since as a Manager you are used to solving problems and using convergent thinking. Our group also found it really hard not talking so much, since that is also something that is quite familiar to us all from the workplace. Our general assessment was that this is indeed a new way of thinking that requires some exercise. From brainwriting we moved on to rapid prototyping. What a laugh we had with this one! Please see our prototype below. Prototyping is a good way of making an idea or service into something concrete which in turn makes it easier to comment and build upon. This is also a great tool for “failing fast” so that you can converge in your ideation and spend your continued efforts on the greatest of ideas. But, as we learned, to have a few great ideas you first need to have a lot of ideas. If you don’t get the volume of ideas, you will never reach the top ones.